The Irrigation and Meteorology Departments are calling on the public to use water sparingly during the next few days. Below-average rainfalls and high temperatures have been reported throughout the month. Irrigation Department Director-General S. Mohanarajah said farmers have been told to use water sparingly to avoid shortages at the end of the month. The water board is also facing difficulties as the public is using more water in the heat and says it cannot assure a reliable supply. “Due to increased demand, people living in inner-city areas and in elevated areas are experiencing poor water supply due to lack of water pressure,” Board Chairman K.A. Ansar said. He said people must preserve water and use purified drinking water only for drinking and other essential activities. Mr. Ansar said water supply in the Kalutara District has been affected due to an increase in salinity in the Kalu Ganga. People there are being sent drinking water in bowsers and told to use the river-pipe water for cleaning. Farmers and people who are living remote areas are badly in need of drinking water. Polonnaruwa District Secretary Panduka Abeywardena said eight water bowsers have been deployed to provide drinking water for four divisional secretariat areas that have 4,300 families resident. “We have sufficient water for Yala season cultivation but we have been preserving tank water by not releasing water to the canals, and that means we have to send out bowsers to give people drinking water,” he said. Water was being released into the canals from Friday and this will continue until tomorrow (Monday). Hambantota District Secretary Bandula Harischandra said 17 bowsers are being dispatched daily to local government areas including Tissamaharama and Lunugamwehera. “We are preserving tank water for cultivation activities so we are providing drinking water to people via bowsers,” he said. He said discussions had been held between the secretariat and the NWSDB on Wednesday to create an action plan. “We agreed to use our water bowsers to transport water to areas where the NWSDB is failing to provide water, and in return they arranged us access to their water source,” he said. He added that officials have plans to dig wells in marshy farmlands in search of water if the poor situation continues. 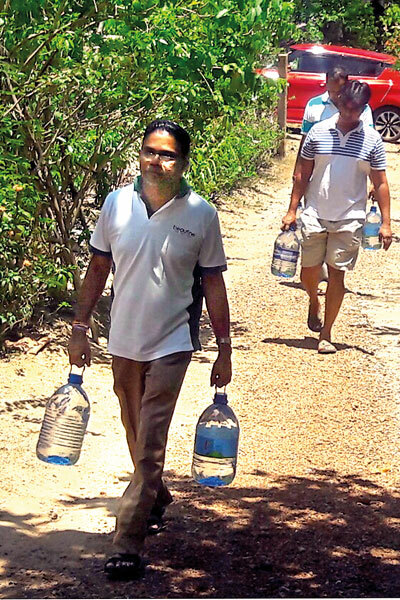 In the Matara district, 10,246 people are facing a water shortage and District Secretary Pradeep Ratnayaka said he had ordered water bowsers to be deployed to stricken areas such as Devinuwara, Matara, Dickwella, Kirindapuhulwella and Hakmana. Devinuwara is the worst-affected area, with almost 4,000 people in need, and there are complaints that not enough is being done to help them. Most of the paddy cultivation in the Hambantota region has come to a standstill due to lack of water. The Meteorology Department said little rainfall is expected, not enough to fill the tanks and reservoirs. Meteorological Department Director Anusha Warnasooriya said she hoped for some rain in the evenings but added that the day’s heat would remain due to the lack of breezes during the inter-monsoonal period. Ms. Warnasooriya advised people to be cautious of the heat and also be prepared for thundershowers in the North, North-Central, North-Western and Eastern provinces and in the Monaragala District after 2pm.